Puttanesca – it’s not what you think! Not every meal has to be complicated, sometimes we are busy and a quick meal made with ingredients you have to hand is required. This where Pasta Puttanesca comes in. I have been making this fast and easy dish for years – whenever I am short on time or when I can’t be bothered going out to the shops. Pasta Puttanesca, translated literally as whore’s pasta, is not so named because it is the favourite food of Italian prostitutes but because it is made from ingredients that most Italians (and Australians these days) have in their cupboard or pantry – they are whoring for ingredients in other words. Pasta Puttanesca is not an ancient Italian dish. It made its first appearance in the 1960s so it has been a relatively recent addition to the Italian cook’s repertoire. 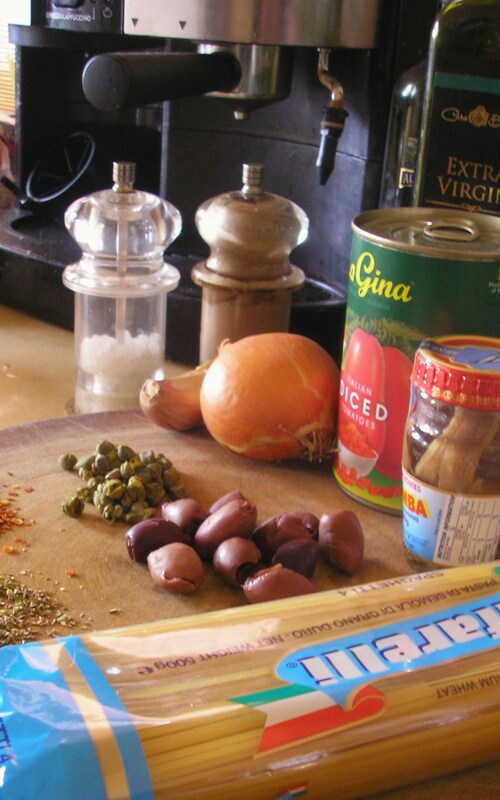 The taste is salty from the olives and anchovies, piquant from the capers, and hot from the chilli flakes. I’m not even going to pretend that I’m being healthy with this recipe for Torta di Cioccolato e Ricotta or Chocolate and Ricotta Tart. 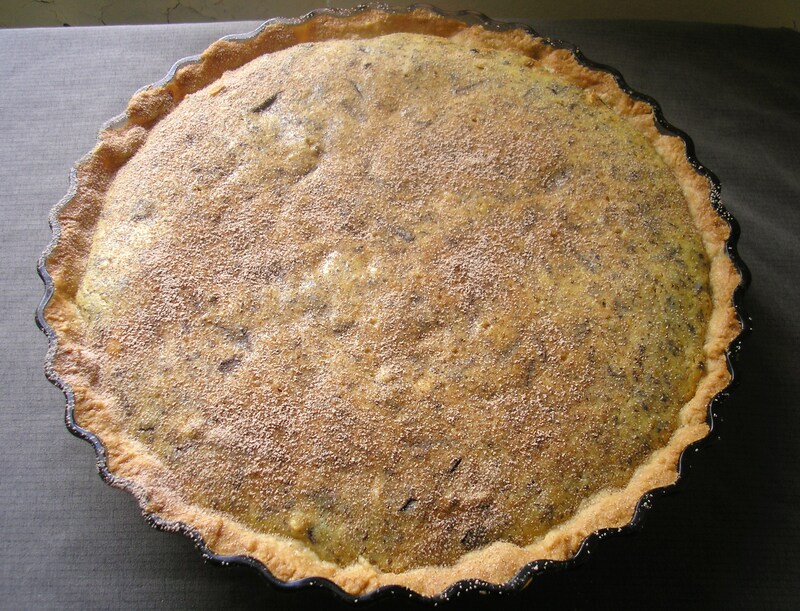 This tart is very rich so it is best to serve it in small portions. I found the recipe in Toby Puttock’s Cook Like An Italian though there was a problem. I don’t know if I had a faulty copy of the book or if some other library borrower had ripped it out but the page containing the recipe for the pastry was missing. I substituted my own recipe so I’ll have to say this is Toby Puttock’s filling with my old recipe for sweet pastry. For the pastry: Rub butter into sifted flours until the mixture resembles breadcrumbs. Add sugar and vanilla and mix to a dough with beaten egg – you may also need a tbs of water to bring the dough together. Wrap in cling film and refrigerate for at least 20 mins. 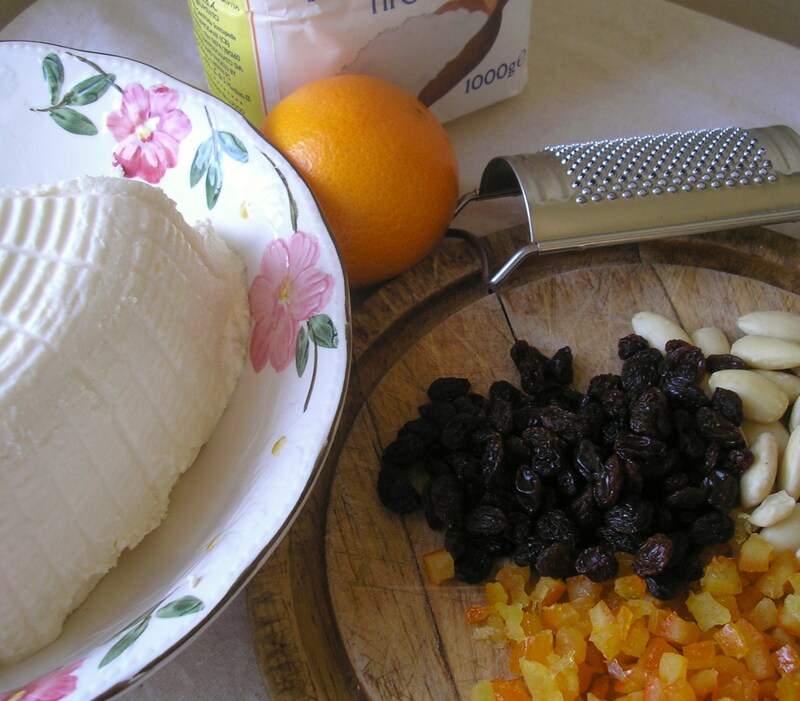 For the filling: Combine ricotta and sugar in a large bowl. Using a wooden spoon, add the eggs one at a time. Add the almonds, citrus zest, chocolate and vanilla. Mix well with the wooden spoon. Cover and refrigerate 20 mins. 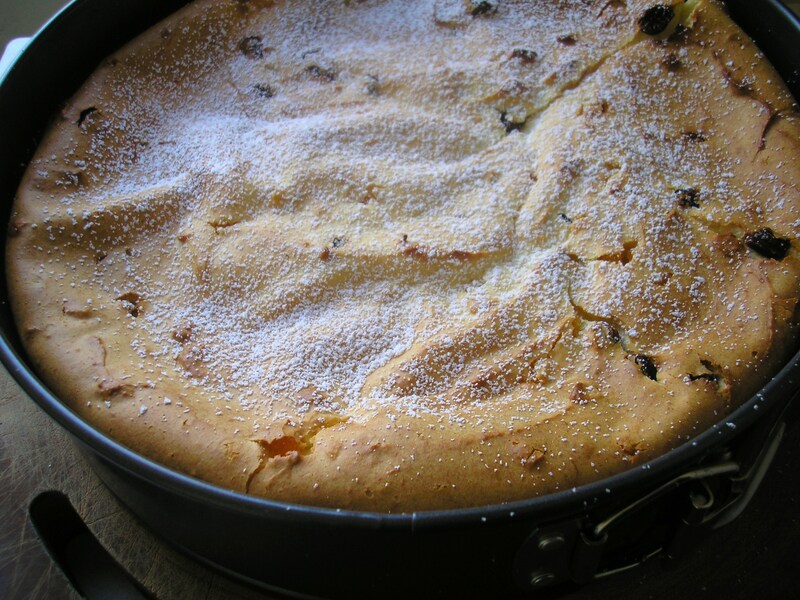 Grease a 25 cm loose-bottomed flan tin with butter. Roll out the pastry to 3-4 mm thick between two pieces of cling film. Lift the top layer of cling film off the rolled-out dough and flip the dough over to drape over the tin, using your fingers to push it into the corners and sides. Peel off the cling film and refrigerate the case for a further 20 mins. (I had some pastry left over, I stored this in the refrigerator to be used in the next day or two for something else). Preheat the oven to 200c. Blind bake the pastry case for 15 mins. or until lightly coloured. 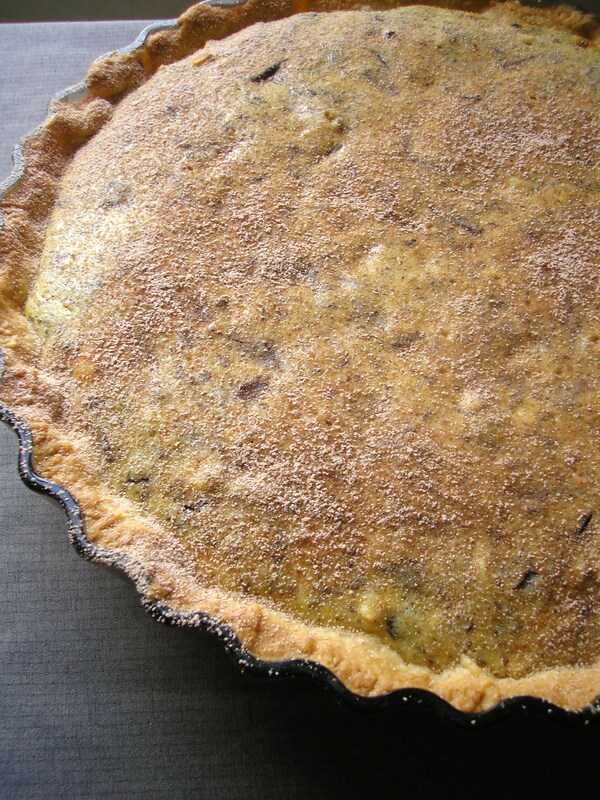 Cool, then fill the pastry case with the ricotta mixture, smoothing it with a spoon. Reduce oven temperature to 180c and bake for 30-40 mins or until the pastry is golden. Remove the tart from the oven and allow to cool. Dust with cocoa and icing sugar mixture.